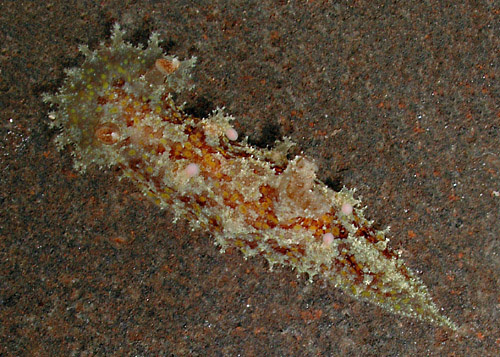 Identification: This is a translucent-gray animal intricately flecked and spotted with white, brown and orange. The pattern becomes progressively more intricate as the animal grows. There are three pairs of elongate papillae on the sides of the notum with the anterior and posterior pairs bearing pinkish "balls" in mature animals. There is a well developed dorsal crest on the anterior portion of the notum. Natural history: Plocamopherus ceylonicus is a moderately rare species known from several animals found at depths of 5-110 m (18-328 ft). The "balls" on the lateral papillae are probably bioluminescent and it can swim by lateral flexing if disturbed. Distribution: Oahu, Maui, Niihau, Midway and Kure: widely distributed in the Indo-Pacific. Taxonomic notes: It was probably first recorded in Hawaii from off Hale'iwa, Oahu by Terry Gosliner and Gary Williams in Oct. 1973 (dredged). Photo: CP: 27 mm: Maalaea Bay, Maui; Oct. 23, 2010.